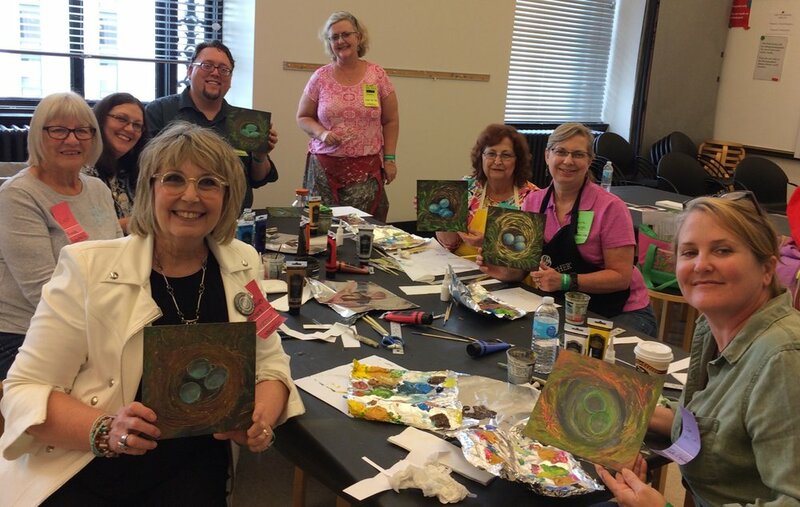 Recently a group of West Tennessee art teachers decided to create a professional development day geared for Middle and High School Art Teachers interested in increasing the skills and engagement of their students. Melanie Trout Anderson, Carrol Harding McTyre, and Leanne Wilson of Arlington High School and Jenna Fergus of Briarcrest approached TAEA President Kathy Dumlao with the idea and what transpired in late January was the West Tennessee Art Teacher Forum hosted by Arlington High School and planned and presented by these dynamic award-winning art teachers. I attended this fun and meaningful event along with several TAEA members from our region. I have already been applying what I learned in my classroom! I have already been applying what I learned in my classroom! After a welcome by Jenna Fergus, we rotated to Leanne Wilson’s classroom for a monoprint workshop. As we enjoyed art making with collograph-type printing, we also enjoyed sharing ideas with one another. Leanne’s use of recycled and repurposed materials gave us all many practical take-aways. Next, we moved to Melanie Anderson’s classroom for a workshop in painting still-life on gessoed posterboard. Melanie’s experience as a working artist and classroom teacher inspired us all. Carrol McTyre lead the next workshop, sharing her Sketchbook “Starters and Finishers.” Carrol also shared slides of how her students had applied these sketchbook prompts. We were then given time to “play” in our own sketchbooks applying some of her awesome suggestions. Jenna Fergus wrapped up our time together by sharing how she develops her students’ writing and critique skills through her CRIT method. She also shared how her AP student’s writing advanced as a result of learning to Describe, Analyze, Interpret and Judge not only famous works of art, but their own work as well. We all left the event recharged, refreshed and ready to see this event repeated! Our members always love to return to the mountains of Gatlinburg for our TAEA Fall Conference every third year. This year we met November 1-3, our theme was, “Celebrating Community Through Art.” Expectations are always high as we settle into the coziness of Arrowmont to learn, to make and to fellowship with one another. This year was no exception. Janis Nunnally and her Conference Planning Committee worked tirelessly to make this conference a meaningful experience for everyone! As we approached the grounds the leaves were ready to dazzle us with colors that made cadmiums blush and each day we were there, they continued to change and become even more brilliant. Some of us arrived early on Thursday for the Board Meeting which met in the Common Room at the Staff House. Following our Board Meeting we gathered in the dining hall for our 2019 TAEA Awards Dinner. Our guests at the Awards Dinner included not only our awardees, but also NAEA President-Elect Thomas Knab and SchoolArts Magazine Editor, Nancy Walkup. The tables were decorated with 25 luminaries called, “Clay Cottages of Hope.” These cottages were made by Melody Weintraub’s students at Briarcrest in Eads, TN and sold at the conference to raise money for the hurricane relief effort in North Carolina. The houses sold out at $20 each during the conference. Including a donation, we raised $540 for our fellow art teachers in North Carolina to rebuild their supplies! Our conference began Friday morning with another recognition of our awardees at our general session meeting led by Janis Nunnally. 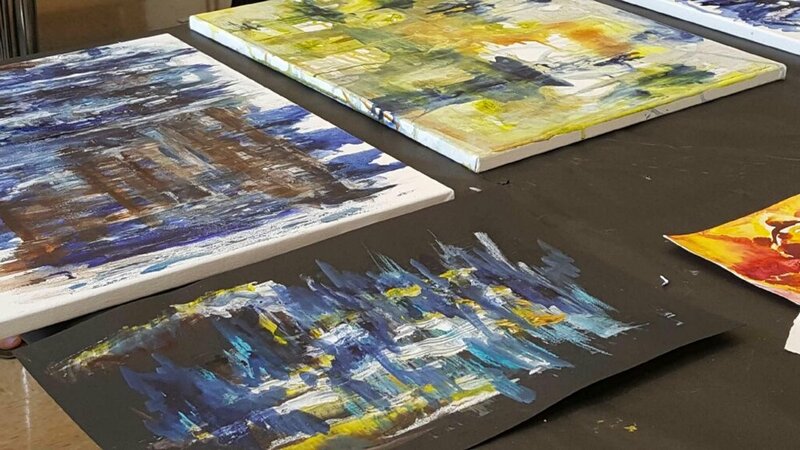 Our first keynote was given by NAEA President-Elect, Thomas Knab shared a bit of his personal art journey and then used the acronym and metaphor of W.A.T.E.R. to remind us of the importance of our roles as Writer, Artist, Teacher, Enthusiast and Researcher. We left his keynote inspired as we headed for an expo of Super Sessions. Thanks to the organizing efforts of Carol Eckert, we had a plethora of sessions ranging from advocacy to classroom and curriculum management, community-based class projects to a crash course on the new standards and more! Then after a second round of super Super Sessions, we gathered in the dining hall for another delicious meal and lots of conversation! After lunch, we had Divisional Meetings. 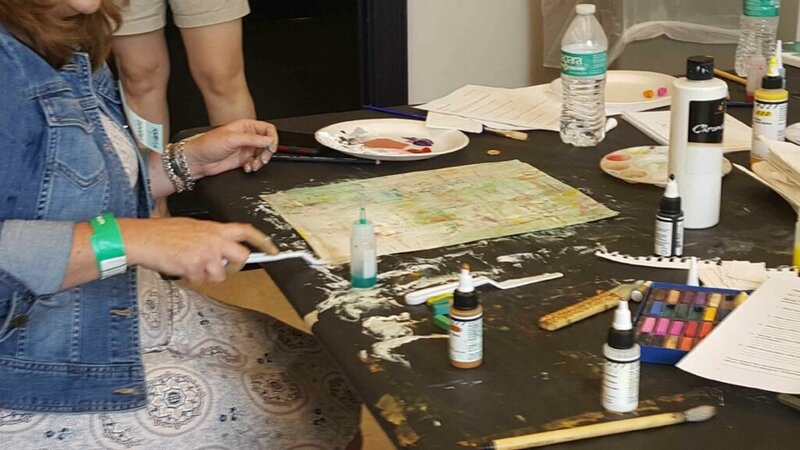 Then another round of Super Sessions before we headed to our amazing Hands-On Studio Workshops which included Printmaking with Bryan Baker, Oil Painting with Lisa Line, Woodwork with Heather Askwork and Clay Pottery with Rebecca Buglio. One Day Workshops included Grace Eckert who taught a Fibers Workshop, and Nancy Walkup shared a Lesson on Day of the Dead. Whew! Dinner followed our workshops and then we had a chance to change into our ‘80’s gear for a fun party planned by Dr. David Meade! The opening night party included over 5 Make-and-Take Demos to choose from, delicious munchies and our some of our incredibly talented artisan members set up shop with everything from beautiful jewelry to hand-woven scarves. Saturday morning began with a powerful keynote by Columbus Museum of Art’s, Cindy Foley, who encouraged us to become the center of creative thinking in our schools. Afterwards we had the opportunity to participate in an Artivism Keynote divided into three sessions. Following lunch we reconvened for our Member’s Meeting, led by our President Kathy Dumlao. The meeting ended with amazing door prizes gathered by our amazing Vendor’s Chair, Rozz Martin! The conference ended with our final session of studio workshops. We all left loaded down with swag from vendors, knew knowledge for best practices, new skills and an art bag of new memories having celebrated community through art!